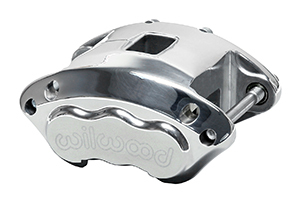 Wilwood's D154 forged billet caliper is a direct bolt-on, lightweight, high-strength, extreme duty alternative to the OE cast iron calipers that were used on a wide range of factory disc brake equipped mid size GM cars and small trucks beginning in 1978. Use of this caliper can still be found on some GM models as late as the year 2002. The wide spread and affordable availability of D154 calipers and brake pad compounds also made it a popular choice in a number of restricted class competition categories and drum to disc conversions on all types of hot rods and street machines. There are three piston configurations available for the D154: A large 2.50" single piston, and two two-piston models featuring 1.62/1.62" or 1.12/1.12" pistons. All three calipers utilize stainless steel pistons. Stainless pistons are used to resist corrosion and retard heat transfer from the pads into the caliper body. High temperature, square faced bore seals are used to provide controlled piston retraction and reliable performance from the wider sealing face. This combination of components is a proven performer with long service life and a history of reliable performance in any type of driving environment, including extreme sustained high temperature racing applications. 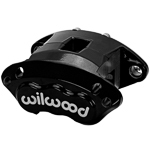 The caliper slide pin holes are fitted with dampening rings to minimize noise from vibration. 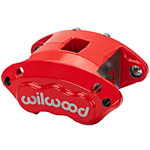 The caliper is also fitted with bleed screws on both ends to facilitate mounting in any left hand or right hand, front leading mount, or rear trailing mount locations.